Whos this Eye Bone Cat Anyway? I was born in Palo Alto Childrens Hospital on July 23, 1952. I grew up in Los Altos CA in a house my father literally built (starting in 1949). Except for the chimney and the foundation. Los Altos was a small Rail Road line town on the SF Peninsula. A town along the "Blossom Line," branching off the main peninsula line at California Ave. (once the town of Maywood) in Palo Alto. Then the line went straight south past Los Altos & Liola Corners, then looped around the west side of the Santa Clara Valley through Monte Vista, and Cupertino, toward Saratoga, & Los Gatos. In my lifetime, Los Altos gradually evolved from mostly fruit orchards to an upper middle class, semi rural, suburb, bedroom community. It reached its full-blown snob status by the time I graduated high school. My early childhood was a little like the "Lil Rascals" or "Our Gang" movies. My street was a dead end at the time. So all the neighbor hood kids would play quite often in the street. We had "Go Cart" (the coaster kind made out of old crates and other scrounged parts) races etc. We had green apricot & dirt clod wars! The street ended at a natural creek. That we also played in. When I was in second grade that all changed. The Army Core of Engineers turned the creek into a fenced off, "Flood Project!" The creek became no longer accessible, or interesting, just a cement ditch. They also put a bridge over it and soon my street became one of the most traveled in Los Altos! After that we all played in our own, or close neighbors yards. The kids scattered into smaller groups who became estranged from each other. The project to beat all projects was an Electric Car he built starting in 1958 while I was in Kindergarten. Again plans from Popular Science. In their version plans called for it to be powered by a small gas engine. But he powered it via helicopter starter motor. In the magazine it was supposed to be a cheesy homemade "Popular Science" wooden bodied replica of an early tiller steered motor car. After Dad built it. Its range was about two miles. But he drove in the annual "Pet Parade" for several years. He would trailer it up-town and enter it in the parade. It would just barley make one lap around the parade route before it would die. He even made the charger for the six truck batteries under the seat. 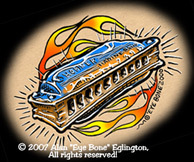 © 2008 Alan "Eye Bone" Eglington, All rights reserved! "I despise "Bigotry" in damn near every form! Which makes me a "Bigot" toward "Bigots"! Which makes me a "Hypocrite"! But thats a form of "Hypocrisy" that I can live with!" my tongue is firmly, deeply, imbedded in my cheek!!! Contrary to popular belief, No Drugs are involved! Reproduction in whole or in part without without express writen permission from the artist is prohibited !